Red Storm: The wheels on the bus go round and round. If you have been following this blog for a while you will know I have commissioned Timecast to produce a load of stuff including industrial areas, town centres, residential areas, old town sections, airport and a few other special pieces for the CWC game in September. Barrie and Mark have nearly finished the second part of the commission and have sent a couple of 'teaser' photos before I pick the finished lot up at Triples in a couple of weeks. 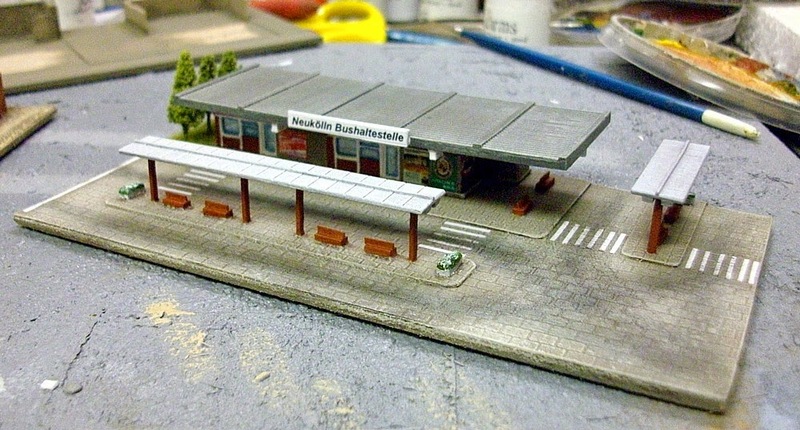 Can't wait to see the rest if the Bus Station is anything to go by. Ooh, that is very nice. Looking really good. Can't wait to see these on the table.